According to conventional wisdom and previous studies, shared meals help families cement relations and bolster children’s academic performances. But a new study co-authored by Boston University School of Social Work assistant professor Daniel Miller says the benefits may not be as strong as suspected. The study was reported in this article in Today’s Dietician. The study analyzed 21,400 children ages five to 15. When researchers controlled for a host of confounding factors they did not find a correlation between family meals and child academic outcome or behavior. To learn more about cutting-edge research done by social workers visit the website of the National Association of Social Workers’ Social Work Research journal by clicking here. “Family dinners” were the time of day my parents had free reign in criticizing everything about me. Certainly didn’t benefit me while growing up! This is disappointing and I hope this is not a widely publicized study. 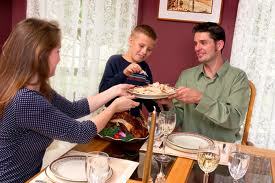 The family structure is already fractured enough without telling families there is no value to shared meals. In my childhood it was the only time in the day we sat down for 20 minutes and focused on each other and that was invaluable. Families meals, and ANY time spent with my children – particularly story time – were always very special. I find it very hard to believe that these ‘studies’ are indeed accurate. Everyone’s score is the same in the schools, even when the quality of work is not. use am IQ test top give a more accurate depiction. It’s already been proven that the schools pass everyone regardless of the work they do.